How Do You Know When Your Painting is Done? This is a question I am asked frequently. I am also asked How Long Does It Take To Finish or Complete Your Painting Or Work? I find these questions curious. To answer the first question of how do you know when you painting is finished or as I say done. What is left when I put down the brush, my hands, or whatever tool , the painting is resting. best answered, for as long as it takes. The Dancing Jewel was completed in 45 minutes and dozens of paint colors per application of brush stroke. The first time I picked up a brush I painted either 45 paintings in 60 days or 60 paintings in 45 days. I’ve never actually been able to keep this straight. 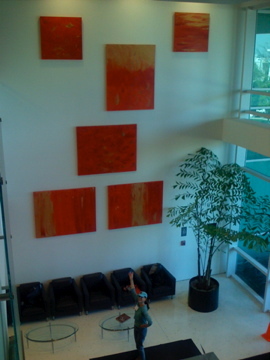 The six large paintings on the 30 foot wall of the Arbia Corporation were done in 4 hours. of thought. And when I am painting, I am in a timeless zone.